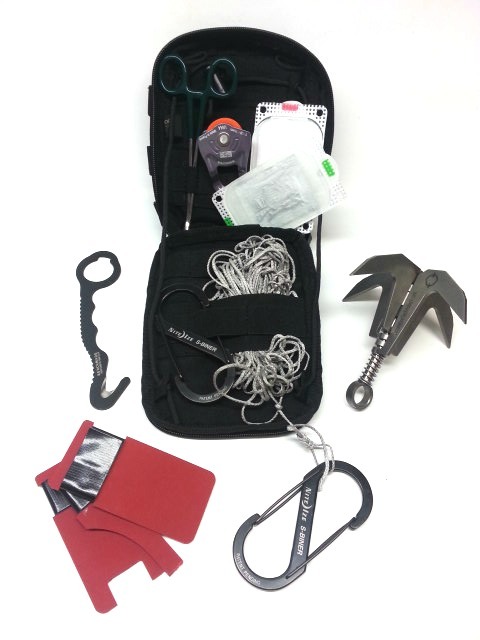 The Mini HAL Kit is for the EOD or TBT that needs a compact kit to conduct recons, remote pulls or remote entries. The case. Yes, stating the obvious. 100 feet Technora 400lb line. The case is not Berry Compliant. Berry Compliant Kit MHALBC is available on our GSA Schule. The kit has 100 feet of Technora line. It's as strong/stronger than 400 but takes up a lot less room in your kit. We send it out Double Daisy Chained. Go Navy! If you don't want it double daisy chained, let us know in the customer notes. We do have a resident expert on not using a double daisy chain on staff. One is none. Two is one. That's why you'll get 2 S-Biners. They're steel/aluminum, definitely not plastic. Pull with confidence. Hook Knife - It's thin, super sharp and has a big ring on the end that can easily hold a carabiner for a remote open. The grappling hook folds flat but deploys in seconds vs having to pull prongs out of a tube, screw the prongs in, replace the cap and then throw. It is big enough to throw and heavy enough to penentrate some ground so you can find trips, command wires, etc. The loop will accept carabiners, the Samson or 550 cord. Folds back flat just as fast as it deploys. Straight forceps are great for getting into tight places to get a wire or to lock up a trip wire. Chemlight pads in red and green so you can mark your way down the trail/hallway to notify your team you have something to avoid or checkout further. Adhesive on the back keeps it on the wall or stuck to the floor so it won't move. The small pulley by Petzl has been a great addition to our lineup of tools. It'll help get you around a corner. It doesn't break away but if you need a cost-effective way to have a break away pulley, give me a call and I'll tell you how it can be done. Zip Ties - The very center of the EOD Tool Universe! Lastly is the Positive Block. I started making these after seeing what some Techs were doing with old hotel room keys. Have had great reviews from the guys in the IABTI Region VI. We know have them machined and do come with a good lenght of 1 inch Gorilla tape, properly buddy tabbed, so you can gag a switch or cocked striker and secure it in place with the tape. NOTE: If you use our Positive Block and in the process of your RSP, blow up the Positive Block, we'll replace it for free! We want pictures! The origin of this kit came from a team in Region VI. They had us make 6 kits for them along with some other gear. I was Navy EOD and I always enjoy sitting down with other Techs to tweak a kit or come up with a solution. If you like this kit but want something a little different, give me a call and we'll figure it out. That's how all of us grow.